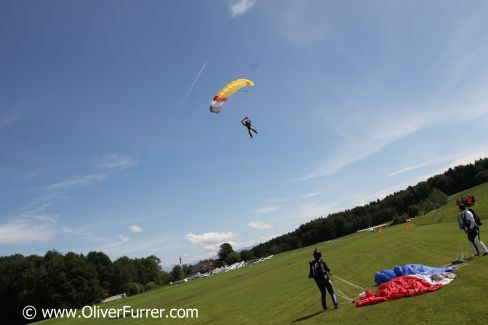 news: 17.08.14: The Fallschirm-Gruppe Freiamt celebrated their 40th Birthday and thereby the PULSEteam joined the event at the Buttwil airport. Next to some fun skydive jumps, everybody enjoyed the sunny day - laying in the chill out lounge, listen to funky music beat’s and watching the crazy parachute landings (due to turbulences at the landing area). skydivers jumped together out of an aircraft. 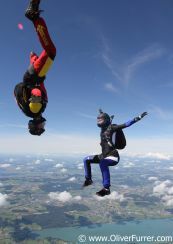 freefly skydivers are flying together. Freefly girls with a ladybird.